Jon Gabriel once tipped the scales at nearly 410 lbs. He tried every diet under the sun with temporary results. He was given a second chance at life on 9/11, and not only lost 220 lbs., but completely changed the trajectory of his life when he started to listen to his body. He discovered that our bodies are genetically hardwired with survival programs designed to either hold on to fat, like in times of famine (deprivation) or ice ages (insulation), or release fat in times of ‘fight or flight’ where being lean would be to our advantage. He calls this the “FAT Program” (Famine And Temperature). When we hold on to the weight, the FAT Program is activated because it thinks it’s protecting us from a perceived threat. We may not be living with the same stressors as our prehistoric ancestors, but modern day stresses activate the same FAT Program. A feeling of lack in the areas of money, love, attention, meaning, etc., are all forms of starvation. Ultimately, once we identify why our bodies are holding on to the weight and we address these issues, we will deactivate the FAT Program and our bodies will begin to lose weight. His book, The Gabriel Method, goes in depth with various examples, theories, tools and techniques. Visualization and meditation are keys to helping us release our mental and emotional need to hold on to the weight. Jon also claims when our bodies are ready to release the weight, they will crave nutritious foods and will want to exercise. 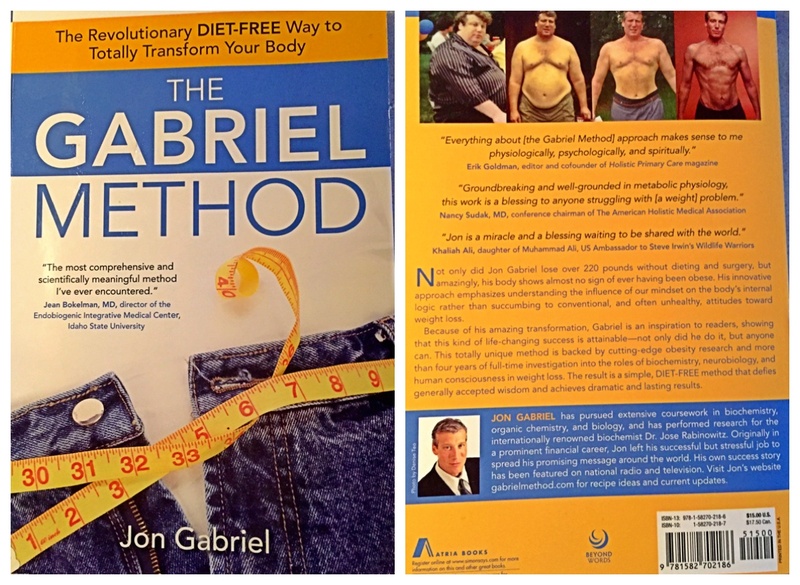 The Gabriel Method is a “concept and an approach,” not a diet. For the sake of my 12 in 12 experiment, I will follow his Month One recommendations. Before going to sleep, look at the picture of the ideal image you’ve selected and practice visualization for a few minutes. Then listen to the CD which addresses emotional starvation, emotional obesity, and mental obesity. Jon recommends, “Go organic and whole grain whenever possible,” but since this is a non-diet, you can enjoy whatever you want for breakfast. Take a probiotic first thing in the morning on an empty stomach, with two glasses of water. Take two digestive enzymes with breakfast. Take an Omega-3 supplement during the day. Take a multivitamin (that includes vitamin E) and a multimineral. Have a healthy snack, preferably organic fruit and nuts, or other “real” (non-processed) foods. Drink a glass of water before each meal, before snacks, and at night. Make an effort to add more vibrant, fresh, and organic foods to your meals.